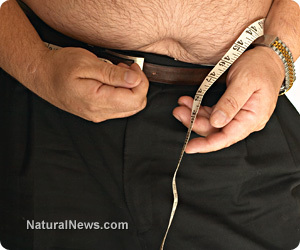 (NaturalNews) There is a well established cause and effect relationship between overweight and obesity, specifically abdominal fat stores and the development of cardiovascular disease and many types of cancer. Recent research studies have shown that belly fat is not metabolically inert, but actively promotes the secretion of many powerful hormones such as cortisol that not only make it more difficult to lose body weight, but also promote systemic inflammation that raise the risk for heart failure, cardiovascular diseases and DNA aberrations that help cancer cells to grow and metastasize. A team of Swedish researchers publishing the results of their work in the journal PLOS Medicine have found that adding just a few extra pounds can raise the risk of heart failure by seventeen percent. Prior studies have failed to determine whether obesity was the cause or just a marker of a separate underlying cause. Scientists in this study used a new technique to examine obesity and determine if being overweight is a valid trigger of cardiovascular disease. Dr. Tove Fall, lead study researcher at the Department of Medical Sciences and the Science for Life Laboratory at Uppsala University commented "We knew already that obesity and cardiovascular disease often occur together... in this study we found that individuals with gene variants that lead to increased body-mass index also had an increased risk of heart failure and diabetes." Researchers studied more than 200,000 individuals for a gene variant that controls appetite and can raise a person's BMI, commonly associated with several cardiovascular diseases and metabolism. The study team found that an increase of only one unit of BMI raises the risk of developing heart failure and cardiac dysfunction by an average of twenty percent. Further, the researchers determined that obesity leads to higher blood pressure, higher insulin levels, worse cholesterol values, increased inflammation markers, and raised the risk of diabetes. Dr. Fall concluded "we can now confirm what many people have long believed, that increased BMI contributes to the development of heart failure." In a separate body of research, scientists from the Brigham and Women's Hospital in Boston, publishing in the prestigious Journal of the American College of Cardiology found that carrying too much fat around the abdomen puts people at greater risk for heart disease and cancer compared with people who have a similar BMI but who carry their fat in other parts of the body. Using CT scans, researchers were able to assess specific deposits of excess fat and how they are linked to disease risk. The study analyzed 3,086 men and women over a period of seven years with an average age of 50 years. During the follow-up period, there were 90 heart-related events, 141 cases of cancer, and 71 deaths from all causes among the participants. Although the team did not come to a firm cause for their conclusion, they suggest that ectopic fat, defined as fat present where it shouldn't be, leads to fat stores around internal organs known to promote systemic metabolic dysfunction and increased disease risk. Evidence continues to mount in support of maintaining an optimal body weight, and how losing small amounts of body fat help to reduce the risk of succumbing to the devastating effects seen with heart disease and cancer.